It’s beginning to look a lot like Christmas, and if you’re lucky enough to be planning a holiday wedding this year (or next) we have a fun idea for a cake! What if your wedding cake looked like a stack of gorgeous wrapped presents? That might be the perfect way to tie the holidays into your celebration! This might be quite the job for your baker, but think of how amazing it would look at the reception! If you don’t want the many mini gifts, you could always take the gift box wedding cake idea BIG and have a wedding cake that looked like just a few gift boxes. All tied with gorgeous green and red bows, of course. The “gift box wedding cake” would be a festive way to add some holiday cheer to your already very happy day. 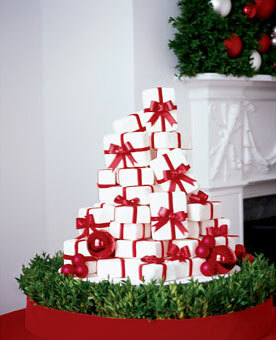 You can find this fun and festive holiday wedding cake idea here.